کوهدار, ولی اله, نوروزی, احسان. (1397). بررسی وضعیت میکروبی گوشت گوساله در کشتارگاه و برخی قصابی های استان تهران. تازه ها در میکروب شناسی دامپزشکی, 2(2), 16-25. ولی اله کوهدار; احسان نوروزی. "بررسی وضعیت میکروبی گوشت گوساله در کشتارگاه و برخی قصابی های استان تهران". تازه ها در میکروب شناسی دامپزشکی, 2, 2, 1397, 16-25. کوهدار, ولی اله, نوروزی, احسان. (1397). 'بررسی وضعیت میکروبی گوشت گوساله در کشتارگاه و برخی قصابی های استان تهران', تازه ها در میکروب شناسی دامپزشکی, 2(2), pp. 16-25. کوهدار, ولی اله, نوروزی, احسان. بررسی وضعیت میکروبی گوشت گوساله در کشتارگاه و برخی قصابی های استان تهران. تازه ها در میکروب شناسی دامپزشکی, 1397; 2(2): 16-25. 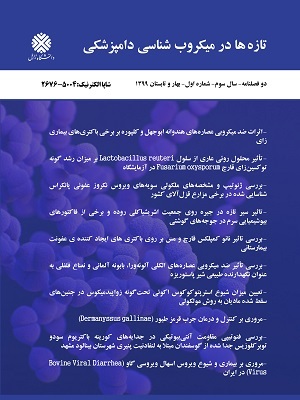 1Department of Food Hygiene and Control Address: College of Veterinary Medicine, Karaj Branch, Islamic Azad University, Rajaeishahr, Karaj, Iran. Meat is one of the perishable foods that can be contaminated and spoiled fast, if the process of production and transportation are inappropriate. Contaminated meat has been implicated in many cases of foodborne illnesses. In this study, neck, flank and rump sites of 15 beef carcasses were sampled with indirect swabbing method. Obtained Samples from final washing stage in slaughterhouse (n=45) and butcheries (n=45) were analyzed for microbial load and the effect of transportation on microbial quality were studied. In slaughterhouse, rump and neck muscles with 4.90±0.45 and 4.21±0.20 log cfu/cm2 were the highest and lowest contaminated area for Total Viable Count, respectively; but in butcheries, flank and rump with 6.16±0.25 and 5.92±0.24 log cfu/cm2 were the highest and lowest contaminated area for Total Viable Count, respectively. The most contaminated area for E coli count in slaughterhouse and butchers were rump with 1.73±0.63 and 2.14±0.06 log cfu/cm2, respectively. 26.67% and 6.67% slaughterhouse and 31.11% and 8.89% butcheries samples were positive for E. coli and Salmonella respectively. There were significant differences (p< 0.05) between the mean of Total Viable Count and E coli count of the abattoir and butcheries samples. According to the results, good hygienic practices should be used in beef slaughtering and transportation of meat.